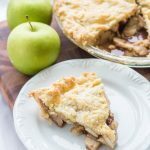 What makes this delicious, crumbly apple pie an Irish apple pie? We can't say for sure, but if this is what being Irish tastes like, we're in! Preheat oven to 350 degrees. Grease a 9 inch pie pan. To make the crust: In a large bowl, combine flours, salt, and sugar. Cut in butter and shortening until coarse crumbs are formed. Mix in sour cream and lemon juice. Keep mixing the dough until a dough forms into a ball, dough be slightly lumpy and that's okay. Wrap dough in plastic wrap and store in fridge and chill for 1 hour. Once chilled, take dough out of fridge and cut in half, keeping one half covered and in the fridge. Roll dough to 1/8 inch and lift into pie shell, trimming overhang of pie crust edges. To make the filling: Place sliced apples into a large bowl. In a small bowl, combine sugar, flour, nutmeg, cinnamon, and allspice. Sprinkle the mixture over the apples and gently toss with a fork. Pour apples into prepared pie plate and pour lemon juice over the top of the apple slices. Roll the remaining pie crust out. Brush outer crust with beaten egg and place the top crust over the apples/ Crimp pie shell and edges together. Brush entire pie with egg wash and sprinkle lightly with sanding sugar. Cut 4 slits into the middle of the pie crust to allow steam to escape and bake in the oven for 45 minutes, or until golden brown. Allow pie to cool completely before serving and serve with whipped cream or ice cream.